These printable sweet sixteen invitations are perfect for customizing your very own photo cards! Simply insert your favorite photo of the birthday girl, add some wording and text, and viola! Perfectly customized birthday invitations for you to print or use however you see fit! DIY invitations using this this template. 1. Download the file, save it to your desktop, and open it in your favorite photo editor. make the changes and print them onto photo paper from your home computer. 2. Do the same as above, yet save the customized birthday invitations to your desktop and upload them to your favorite online printer. I really like Vistaprint.com. 3. Print the file onto cardstock and stick on your own photos or even attach cool photo magnets! Paint.net - I really like this one and use it quite often. Gimp.org - Image Manipulation Program. Pixlr is another good one, which you don't even have to download or install. Works for you right on the net! So, ready to get started? 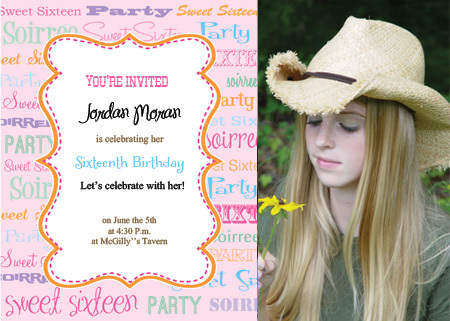 Download our free printable sweet sixteen invitations Jpeg file here. Save the file to your desktop to open in your favorite photo editor, photoshop, or similar program. Customize and enjoy! What do you think of the colors I chose? If you love the invitation but had a different color scheme in mind for your party, please let me know! I will create a new file just for you and post it here on the site for free! As always, I'd love to see your creations! If you choose to use this invitation snap a pic and upload it to our "show and tell" section!